Mangrove Golden Whistlers would be better known by one of their older names, Black-tailed Whistler, because they are certainly not restricted to mangroves. 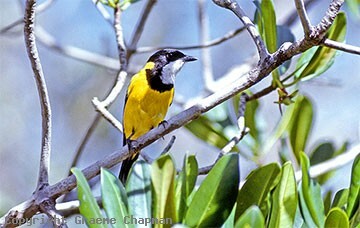 In Western Australia the subspecies "melanura" is largely restricted to mangroves, but in northern and eastern Australia, the subspecies "robusta" is well distributed in low tropical scrub both on the mainland and especially on offshore islands as far south as Shoalwater Bay in Queensland. Females of the subspecies "melanura" (pic 400202) are fairly dull coloured on the underparts, whereas birds from northern Australia (robusta) are largely yellow underneath and quite distinctive - see pics 400205D and 400210D. 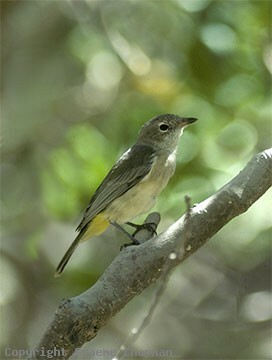 Down the east coast of Queensland where they are quite rare on the mainland, another population occurs on offshore islands in which females also lack the yellow underparts, except for the ventral area. 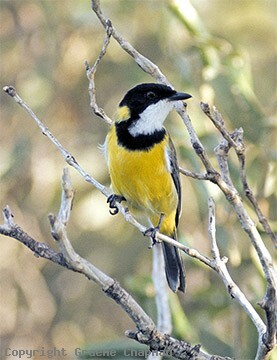 The males are not easy to distinguish from ordinary Golden Whistlers - they do have a larger bill, not easy to judge in the field. They may prove to be another subspecies. 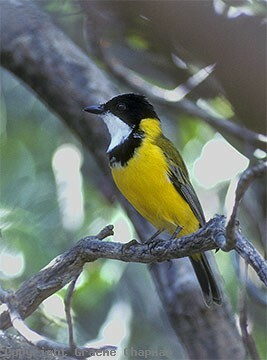 Males of all subspecies are never easy to distinguish from the more familiar Golden Whistler, except for their calls which are much more mellow sounding. The plumage variations in this species are quite complex and discussed at some length both in HANZAB and The Directory of Australian Birds by Schodde & Mason.